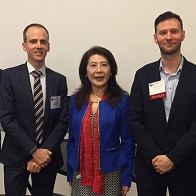 Dr. Junko Sugawara, associate professor, supply chain and logistics technology, was a featured panelist addressing the expansion of the Panama Canal and the benefits, challenges and opportunities for further growth. The American Australian Chamber of Commerce - Houston hosted the event, April 13 at Sage Plaza, Houston, Texas. Other panelists included Ty Reasonover, senior trade development manager at the Port of Houston and Dr. Walter Kemmsies, managing director, economists and chief strategist, ports, airports and global instructor at JLL.